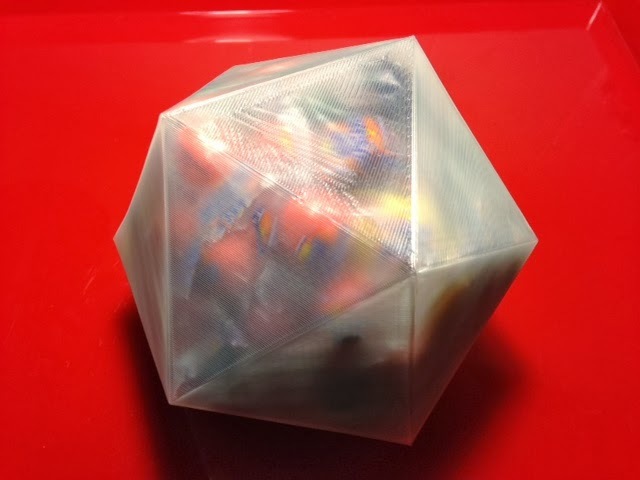 This year's prize at the SUMS Conference is a lot of jawbreakers trapped inside a 3D-printed icosahedron (symbol for the Mathematical Association of America). Technical notes: This is the second Replicator 2 that I've worked with that needed a replacement xyz motor wire harness within the first few months of use. If your Replicator 2 starts shifting inches to the left or right in the middle of prints, and/or if it makes a loud stuck sort of noise when you do a "home axes", then you too may have this problem. MakerBot technical support took me through a diagnostic routine and then send me a new cable for free in both cases, so call up tech support if this happens to you! Stuff you might want to change: The model had to be rotated to be flat-side-down, which made the top and bottom be not quite flat. I repaired the bottom but not the top, and this caused some problems when the top part of the model printed by bridging across. If I were to do this again I would get a model from Mathematica and make sure it was rotated correctly before importing into Tinkercad.